Christians, in common with many other people of faith, believe that God created the universe. The Bible tells us that ‘The Earth is the Lord’s and everything in it’ (Psalm 24:1) and we are asked to be good stewards protecting the world that God has made (Genesis 1:26, 2:15). The earth is therefore our God-given home so it’s only right that, as pilgrims, we should try to be good ‘house guests’ and tread lightly as we travel along the Pilgrim’s Way. Caring for Creation is recognised as one of the five main ‘missions’ of the Anglican church. We are asked to strive to safeguard the integrity of creation and sustain and renew the life of the earth. He is the image of the invisible God, the first-born of all creation; for in him all things were created, in heaven and on earth, visible and invisible, whether thrones or dominions or principalities or authorities—all things were created through him and for him. He is before all things, and in him all things hold together. Going on pilgrimage is a wonderful opportunity to reconnect with the natural world and sense the underlying unity of all things—to see every part of creation as an expression of God. Along the Pilgrim’s Way you will walk through many nature reserves and be able to see rare orchids, bats, butterflies and birdlife as well as lovely wildflower and grass chalkland meadows. Do take time to ‘stop and stare’ and become more aware of what’s around you. Sit under a tree in contemplative silence. Or on a bench at the many viewpoints en route and simply enjoy the beauty of creation. 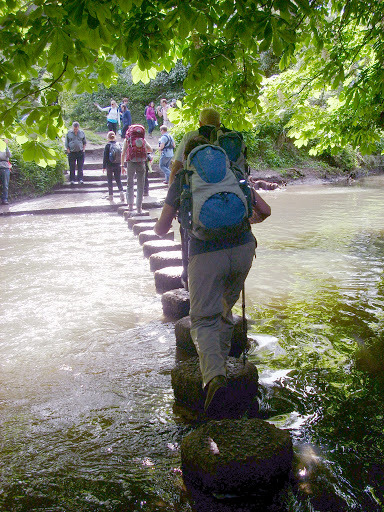 The Canterbury diocese is a member of the Green Pilgrimage Network, a global network of pilgrim cities and sacred sites, brought together by the Alliance of Religions and Conservation (ARC), which seek to be models of green action and care across different faiths. The vision is that pilgrims, and the places that host them, will be cleaner, greener, and leave a positive footprint on the earth. For more details on the Green Pilgrimage Network, click here. To learn more about responsible living as a Christian, click here.